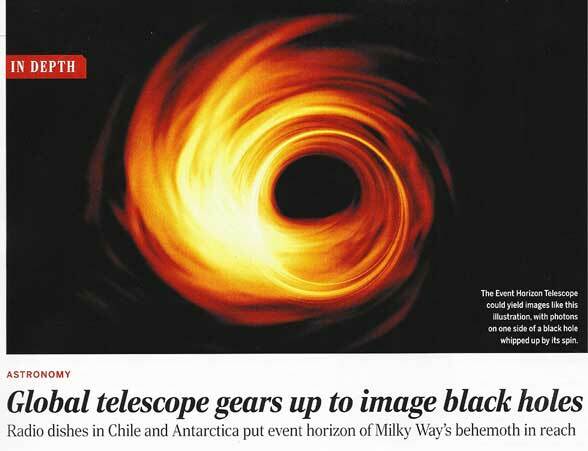 this article in Science magazine describing how the Event Horizon Telescope (EHT) is finally getting ready to maybe, just perhaps, or just barely, or almost, take a picture of the event horizon around a black hole. How neat is that if the astronomers succeed in seeing what can't really be seen. The team of radio astronomers, which includes eight observatories around the globe, plan for a 10-day observing period from April 5-14, 2017. If they get good weather compatible with radio observing, they hope to capture the hot gas swirling around the event horizon of the black hole in our own galaxy and M87. With the current number of eight observatories, the aperture of the whole system is about the same as the size of the earth. Further details of the study can be found in the March 3 Nature magazine. Wow, if you just think of all the arm twisting that was necessary to get eight observatories to agree to this 10-day observing session, it makes our little amateur quests just to hope for clear weather on the upcoming OCA Blackstar canyon party seem pretty easy. One my recent and rare visit to Facebook I discovered several good videos of special interest to amateurs and armchair cosmologists. First is this wonderful video posted by Kept me from Violating Export Laws, Cindy. This video starts with a view of a person on the ground and then the camera moves to higher and higher altitudes until the view has left the Earth, then the Solar System, and on to way beyond. It is pretty neat to look at and experience the thrill. Thanks for that, Cindy! Also, Resident Astronomer Peggy, found another excellent video describing the most detailed map of the universe yet produced. This is also a very interesting video and pretty amazing how astronomers can work out this 3-D structure just by look through a telescope. Thanks for that, Peggy! 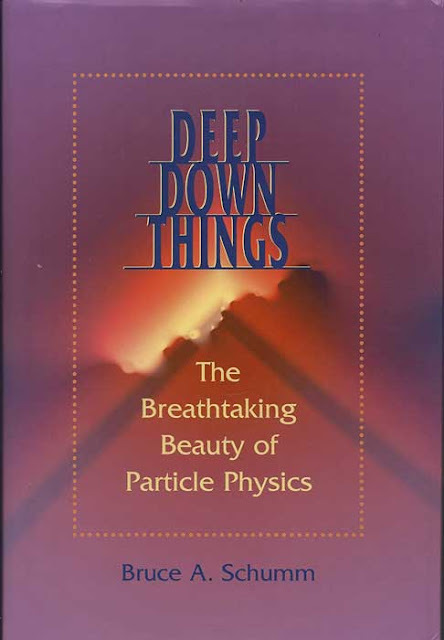 Now, after trying to remember and understand what we heard about at the PCGM, especially about spin, symmetry and gauge theory, I reviewed some of the papers and presentations made there and found that this book, "Deep Down Things" by Bruce Schumm, was often listed as one of the references. I resolved to get me a copy and found that I had purchased this book over a year ago and had only go up to page 5. Well, now is the time to get started on it again and found that a major part of that book covers symmetry, Lie algebra and gauge theory, from a mostly, low mathematical standpoint. I found his explanations much easier to understand than what I had found in my more technical texbooks, where those authors often described some initial concepts in a couple of paragraphs and left the details to be worked out by the student, which in my case did not result in much useful learning. If you are interested in symmetry and spin as used in quantum field theory, check out this diagram copied from "Deep Down Things." Spin and symmetry have to do with what part of a revolution or how many revolutions an object, mostly mathematical objects, but here how many revolutions are needed to return the object its original position or at least a position that looks the same as its starting position. Particles which have spin of 1/2 or spin 1 or spin 2, for example, required different amounts of rotation to come back to their initial starting position. When I showed this to Resident Astronomer Peggy, she said it looks like the object is only rotated through 180 degrees, not 360 degrees as noted. What? 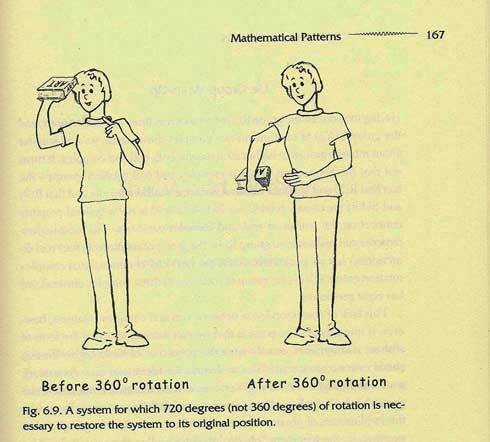 Ok, ok it seems to just be 180 degrees, but when you read the text and the rules of spin you see that the object has been rotated by 180 degrees, enough to keep the top of the book on top in the new position and so the total rotation is 180 + 180 = 360 degrees. Or least that is my explanation now as I continue reading the book. The good news after trying to do this exercise manually myself, I found I was getting a good physical workout too! Ok, ok, it might not be the same level of physical workout that many of you do! Now, just in case you are wondering how it is that Amazon delivered this book a year ago and I'm just now starting to really get going in it, the following picture explains the situation. 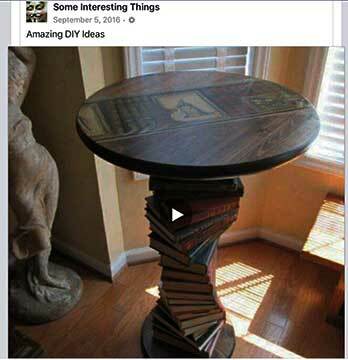 I don't get to Facebook too often, but this post from Some Interesting Things tells the whole story about books getting arranged in a pile and how it is sometimes hard to get to that one on the bottom. In my case, I have stacks of books on top of tables which themselves have stacks upon stacks. It is hard to keep things straight so I switch to martinis when the stacks get too high! This week I also had a chance to meet up with Was Semiconductor Physicist, Now Astronomer, John, for dinner and then go to the OCA Astroimagers SIG. I had not been there for at least six months and it was good to be there and hear from some of the really talented astrophotographers. Dave Pearson presented the evening's lecture, "Anatomy of Image Capture -- Looking Behind the Curtain. Boy, I guess it was behind the curtain and the presentation was quite technical and covered the tradeoffs between image exposure time, histograms, standard deviation, noise and the number of images to be stacked and the ultimate goal of achieving the desired signal to noise ratio. It was pretty complicated and I felt as if I had wandered into one of the signal processing seminars that I attended when doing engineering, but Dave did a good job of explaining all the details with charts, graphs and calculations. Just being there too triggered a memory of one of the first visits I made at the Astroimagers SIG, now over two years ago. I met Dave Kodama there and he offered some good advice and encouragement and at one point answered my question if amateurs can take images of satellites in geosynchronous orbit? Yes, they can he said and showed me some of his images. Well, I was quite excited by this and set out to do the same thing myself. If you're interested in part of that story, check out the blog post of January 15, 2015. Anyway, I decided that I should include Dave's website on my blog's recommended websites and you can find that website there too and check out some of his fantastic astroimages. Thanks for all of that, Dave! Finally, we should report on the LISA Spectrograph project that was started also over a year ago and is now back on course. I spent almost all of one morning plugging in all the cables and installing all of the software and drivers on my Surface Pro. 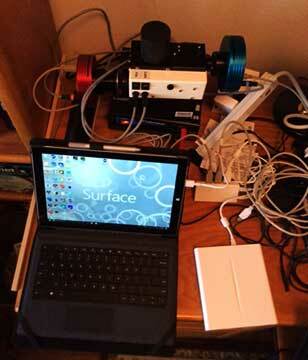 Check out the photo of the desktop and cables. The Red camera on the spectrograph is the imaging camera and the blue camera is the guiding camera. The cameras are operated by software on the Surface Pro and a USB hub is required to interface all the USB cables to the single USB port on the computer. Taking spectra of stellar objects requires that the telescope track good enough to keep the object aligned on the very narrow (much less than a millimeter) and track continuously for several minutes at a time for dim objects. It takes a lot of exposure time because even though the target object, like a star, only covers a small area of pixels, the spectra is spread out over a whole line that covers the entire image size and this means that all that light is spread out over hundreds of times the number of pixels. There is a power cable and a USB communication cable for each camera and the guiding camera will have one more camera going down to the mount guiding port. The spectrograph also has two power cables on it making a total of about six cables that ultimately have to leave the spectrograph, which is to be mounted on the telescope/mount and the computer (Surface pro) which does all of the guiding and image collection. This is just a big complex collection of equipment that all must work together and the cables have to be free of the mount as the mount slews from target to target. I hope I can get all of this stuff to work together? In fact, this uncertainty is why I have procrastinated on starting this project for over a year now, but the time has finally come. The first test of the spectrograph on the bench top consisted of taking off the cover on the optical tube that fits in the telescope barrel (the cover is the black cylinder shown in the photo between the two cameras) and taking a spectra of the ambient laboratory room lighting. 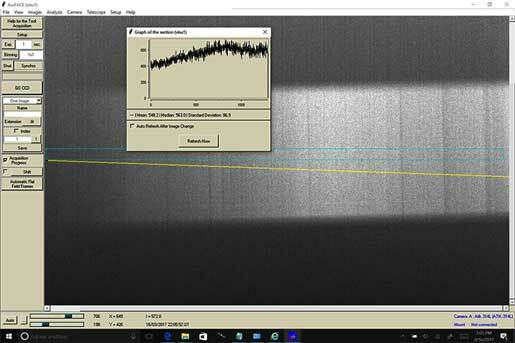 The image below represents the first image of light entering the spectrograph. 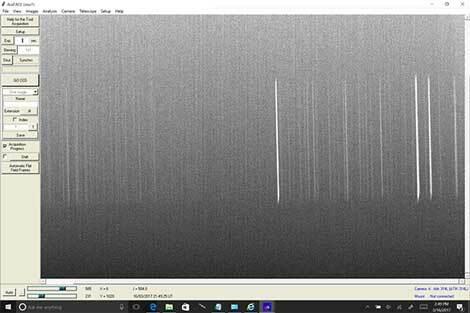 I sort of see spectral lines, sort of like absorption lines, in the image and wonder if this is what the spectrum of indoors lighting would be? I haven't finished reading the spectrograph manual (of course), so I don't know exactly how to interpret and calibrate the spectrum. I did try one other test and that was to cover up the optical inlet tube and turn on the neon light calibrator. 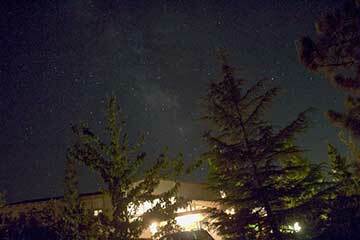 The image below shows the 2-second exposure with the calibration light on. I suppose I will eventually learn to identify some of those emission lines with particular wavelengths and thereby be able to have wavelength displayed across the horizontal axis and be able to identify wavelengths and scale factors. So, there is still a lot of work and more to learn about taking and interpreting spectra of stars and nebulas, and that is enough work and news for this week. The weather forecast for the coming week is not friendly for astronomical observing. Anyway, I am not observing next week because I will be in San Francisco at the TechIgnite conference. I might be able to post some status updates from that conference so you can follow what is going on with the disruptive technologies discussed there.